Oregon Rediviva | Whither Yeatum? You might undertake a vegetarian diet for any of a number of reasons. One might be that you were a Seventh-Day Adventist. 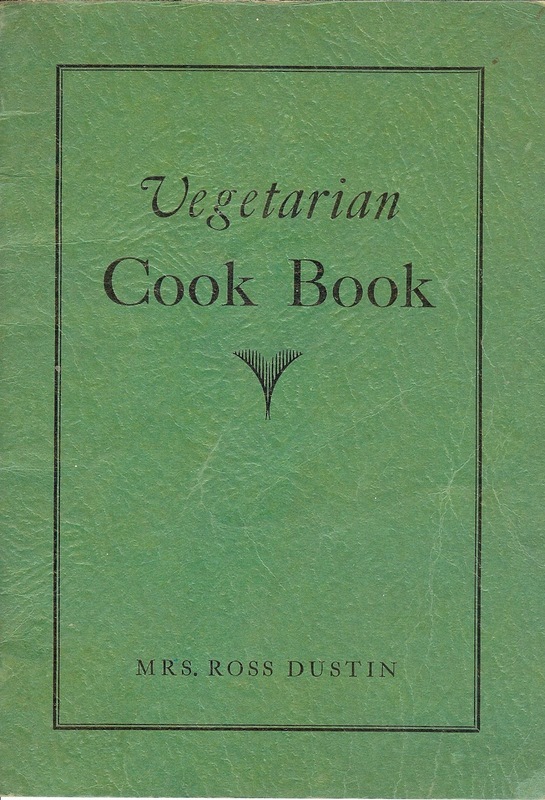 I recently picked up this cookbook, which dates from about 1935, “published in answer to many requests from friends and guests at the Oregon Conference of Seventh-Day Adventists Camp-meeting cafeteria.” The author is Mrs. Ross Dustin; a little research suggests that the Rev. Ross Dustin served as a pastor at a Seventh-Day Adventist church in the Eugene area in the mid-1930s. Put ingredients in double boiler and boil for 7 hours or until thick enough to spread when cold. Put in half pint jars while boiling hot and seal. That yeast would be perishable compressed or cake yeast; a pound of it was about equivalent to 24 packets of today’s dry yeast. You can’t get Instant Postum anymore (it was discontinued in 2007), though you can find recipes online to make an equivalent product. Postum was developed by C. W. Post in 1895 as a healthful, grain-based caffeine-free beverage; an instant version came out in 1911. And Kitchen Bouquet (it’s still on the market) is, says Wikipedia, “a browning and seasoning sauce primarily composed of caramel with vegetable flavorings.” Add a bit of salt and garlic, and this recipe would give you a supply of yeasty flavor booster. In the cookbook, a spoonful of Yeatum appears in recipes for gluten nut meat, mock chicken pie, nut-cottage cheese loaf, mock salmon patties, carrot loaf, egg gravy, and other savory dishes. Today, a variety of ready-to-use vegetarian products has sent Yeatum to the compost bin of culinary history: a Google search turns up nothing, nothing whatever.